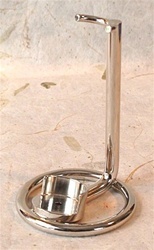 Nickel razor holder. Display your razor proudly with this universal and distinctive stand. Specs: Razor holder is 3" (76 mm) from base to top of upper razor holder. Upper razor holder inside opening is just over 9/16" (15 mm). The bottom rear wall is just over 5/16" tall (9 mm) and the base is just under 7/8' (21 mm) in diameter.